Is China sparking an American Renaissance? (1) Bank loans. When China joined the World Trade Organization during December 2001, the country’s banks had $1.4 trillion in loans outstanding, which was equivalent to 35% of US commercial bank loans. At the start of this year, Chinese bank loans rose to a record $12 trillion, now equivalent to 162% of their US counterparts! Those numbers don’t include the lending of the shadow banking system. 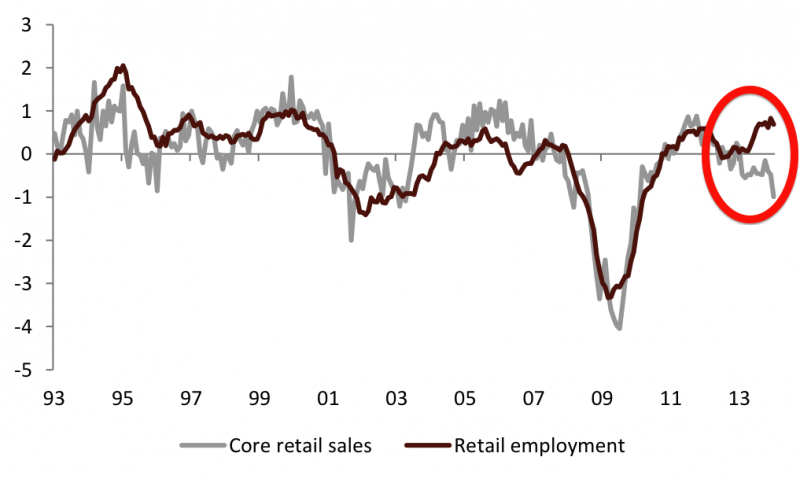 (2) Deflation. Coal companies seem to be at the epicenter of the current rising default risks in China’s shadow banking system. That’s because coal prices are falling. So are other industrial prices, according to China’s PPI, which is down 1.6% y/y through January. It has been deflating since March 2012. China’s CPI is still inflating at a moderate pace, with an increase of 2.5% y/y through January. The combination of lots of debt and mounting deflationary pressures increases the risks of a credit crisis in China. Societe Generale has defined its hard landing as a fall in Chinese growth to a trough of 2pc, with two quarters of contraction. This would cause a 30pc slide in Chinese equities, a 50pc crash in copper prices, and a drop in Brent crude to $75. 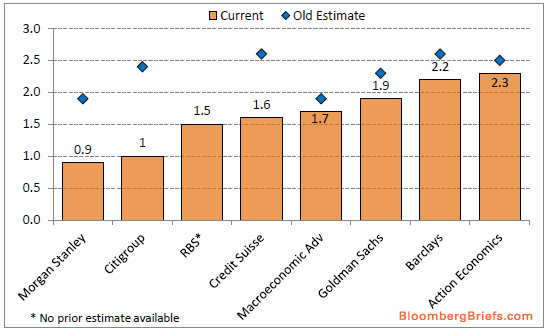 "Investors are still underestimating the risk. Chinese credit and, to a lesser extent, equity markets would be very vulnerable," said the bank. Such an outcome -- not their base case -- would send a deflationary impulse through the global system. This would come on top of the delayed fall-out from China's $5 trillion investment in plant and fixed capital last year, matching the US and Europe together, and far too much for the world economy to absorb. [JP Morgan analysts] Haibin Zhu says there is mounting risk of "systemic spillover". Two thirds of the $2 trillion of wealth products must be rolled over every three months. 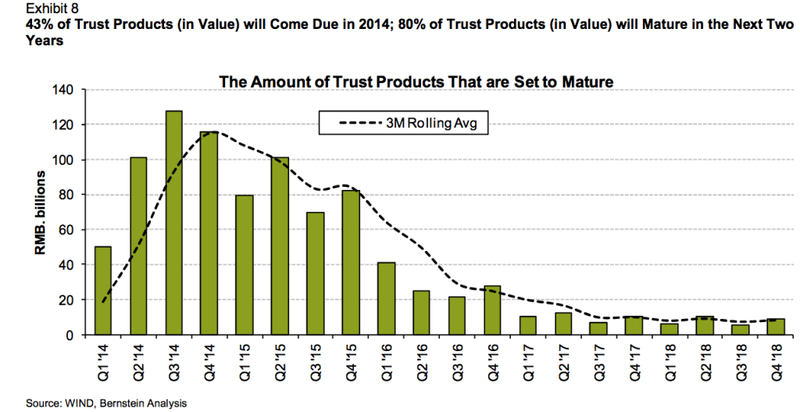 A third of trust funds mature this year. "The liquidity stress could evolve into a full-blown credit crisis," he said. Officials from the International Monetary Fund say privately that total credit in China has grown by almost 100pc of GDP to 230pc, once you include exotic instruments and off-shore dollar lending. The comparable jump in Japan over the five years before the Nikkei bubble burst was less than 50pc of GDP. While the world focuses on China, it's also important to think about the second order effects of all these changes that are happening. In addition, we would see a downshift in commodity demand because of lower investment spending. Such changes would have profound changes for American manufacturers. The pace of onshoring would accelerate as the advantages of offshoring to China diminish, which implies a higher economic growth rate as jobs return to US manufacturing. As well, operating margins could expand because the cost of inputs would fall because of lower commodity prices. These are the ingredients for an American Renaissance. As I write these words, it appears that China may not experience neither a hard nor soft landing, but a long and bumpy landing. Every time the Chinese leadership signals its intent to reform the economy, stresses start to appear and Beijing blinks (see Will Beijing blink yet one more time?). [C]redit tightening was clearly a headwind for growth in the 1990s. However, the sharp credit growth slowdown between 1998 and 2000 did not lead to major growth problems in the broader business activity. In fact, amid the credit crunch, the economy was able to withstand major global shocks such as the Asian financial crisis and the global tech bubble bust, and stayed largely stable without major financial stress. If history is any guide, we expect the economy and financial system to remain resilient in the ongoing tightening cycle, especially as policymakers are in no rush to hasten the “deleveraging” process, and the global business cycle is gradually on the mend. If the Chinese leadership continues on this path of talking tough on reform but finds its initiatives watered down because they run up against entrenched interests, then China faces the worst of all worlds. 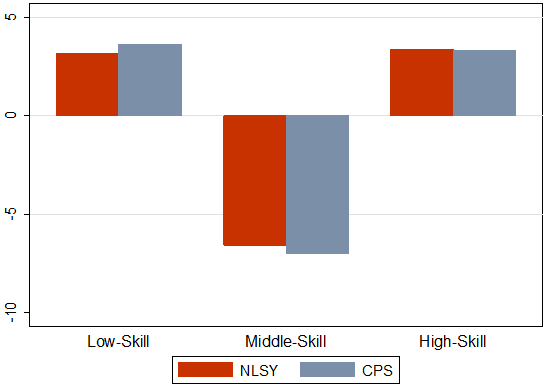 While a hard landing could be avoided for a considerable amount of time, China faces a lost decade of ever slowing growth without the targeted rebalancing of growth from infrastructure spending to consumer spending as the primary engine. At the same time, the American Renaissance would continue as rising Chinese labor costs erode competitiveness and falling commodity prices enhance the operating margin of companies based in the developed markets. But we need to get real about the so-called renaissance, which has in reality been a trickle of jobs, often dependent on huge public subsidies. Most important, in order to compete with China and other low-wage countries, these new jobs offer less in health care, pension and benefits than industrial workers historically received. In an article in The Atlantic in 2012 about General Electric’s decision to open its first new assembly line in 55 years in Louisville, Ky., it was not until deep in the story that readers learned that the jobs were starting at just over $13.50 an hour. That’s less than $30,000 a year, hardly the middle-class life usually ascribed to manufacturing employment. This disturbing trend is particularly pronounced in the automobile industry. When Volkswagen opened a plant in Chattanooga, Tenn., in 2011, the company was hailed for bringing around 2,000 fresh auto jobs to America. Little attention was paid to the fact that the beginning wage for assembly line workers was $14.50 per hour, about half of what traditional, unionized workers employed by General Motors or Ford received. For this chart, the high-skill occupations comprise managerial, professional services, and technical occupations; middle-skill occupations are things like sales, office/administrative, and production occupations; and low-skill occupations include food, cleaning, and personal service occupations. Manufacturing will become increasingly global, with estimates as high as 80% of manufacturers having a multi-country operation. The technology used on assembly lines continues to growth more and more sophisticated, making automation far easier to implement. 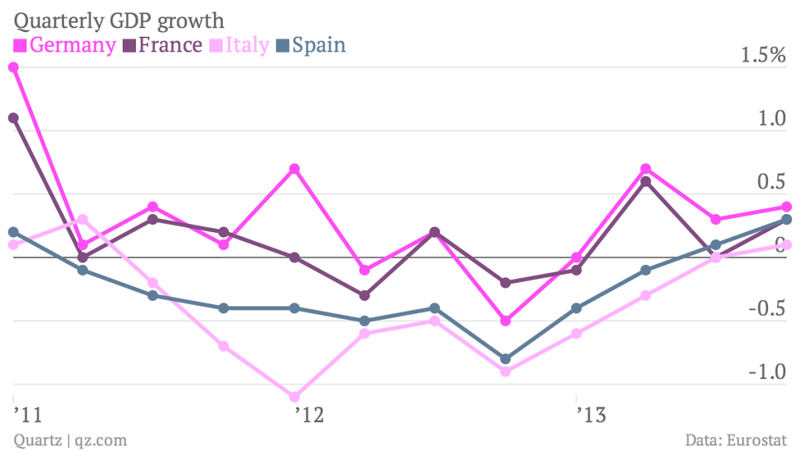 For the suppliers of labor, these shifts present a good news-bad news story. The good news is that there will be more jobs; the bad news is that the jobs won't pay as well as manufacturing jobs used to. American workers may welcome the return of jobs that were previously offshored, but they will largely be working either directly for a multi-national or for a company in the supply chain of a multi-national. If you are competing with Third World countries for work, don't expect First World compensation. For the suppliers of capital, these shifts represent unabashedly good news. Operating margins are likely to get boosted upwards because of lower input costs from falling commodity prices and more responsive manufacturing because of a more educated labor force and lower transportation costs from being closer to end consumer markets. As well, the returns to capital are likely to improve as cheaper automation drive down the price of capital expenditures, which raises overall returns on assets employed. Longer term, these changes are incredibly bullish for US equities and moderately bullish for the US economy. Will Beijing blink yet one more time? China’s credit-market gauges are triggering alarm bells, as banks grow cautious in lending to each other while investors prefer the safest government bonds. The spread between the two-year sovereign yield and the similar-maturity interest-rate swap, a gauge of financial stress, reached 121 basis points on Feb. 19, the widest in Bloomberg data going back to 2007. Two days later, the cost to lock in the three-month Shanghai interbank offered rate for one year reached an eight-month high of 94 basis points over similar contracts based on repurchase agreements, which are considered safer because they involve government securities as collateral. Billionaire investors George Soros and Bill Gross have drawn parallels between the situation in China now and that in the U.S. before the 2008 financial crisis, when traders gauged lending appetite by monitoring the difference between the London Interbank Borrowing Rate and the overnight indexed swap. Premier Li Keqiang’s efforts to curb leverage in the world’s second-largest economy by driving up borrowing costs need to be handled carefully to avoid wrecking confidence in the financial system, according to Nomura Holdings Inc. In addition, the CNYUSD exchange rate has fallen dramatically. In short, the credit and FX markets are starting to freak out over China. In the past, whenever China's economy has approached the edge and stared into the precipice, the leadership has blinked and come to the rescue with the same-old-same-old tools of infrastructure spending and credit creation. Indeed, it has continued to do so despite all the rhetoric about reform and allowing market forces to take a greater role in the economy. What about the worries about a financial contagion over the impending default of two trust products (see the discussion of China tail risk in How 2014 could be like 1929). 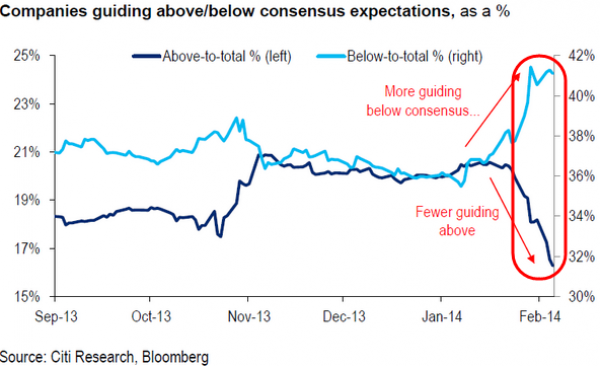 Bejing blinked again and bailed out another trust product (via Zero Hedge). There’s been a lot of over-hyped talk of China tightening and deleveraging over the past few weeks. Sure, inter-bank rates and corporate bond yields have significantly increased over the past year. But if you include things such as central bank injections into the inter-bank market and unsterilised foreign exchange purchases – where the central bank buys foreign currency to maintain the partial dollar peg – it’s clear there’s been no net tightening at all. 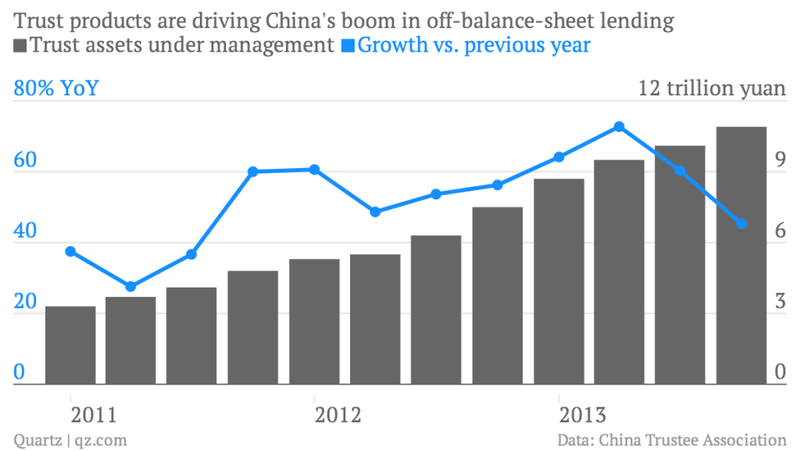 As for deleveraging, figures released on China lending over the weekend should be enough to put that to bed. January lending was the highest in four years. More worryingly, total societal financing – a broad measure of credit including shadow financing – increased to 2.58 trillion yuan, smashing analyst estimates of 1.9 trillion yuan. China remains addicted to credit despite the racheting up of rates. The fact is that China’s President, Xi Jinping, hasn’t done nearly enough to deflate the country’s credit bubble. He needs to do three things, and fast: 1) allow defaults of wealth management products so risk can be properly priced 2) accelerate structural reforms laid out late last year 3) lower Beijing’s bottom line for GDP growth from 7% to a more realistic 6%. Without these initiatives, Xi risks a much larger economic blow-up in the not-too-distant future. Despite recent market jitters over reduced property lending, Beijing has exhibited a pattern of pushing a reform agenda, but unwilling to bite the bullet when critical sectors of the economy get pushed to the edge. If history is any guide, the Chinese leadership will continue talking tough on reform, only to see its initiatives get watered down as they run up against entrenched interests. As I write these words, Asian stock markets are mildly positive with the Shanghai Composite and the Hang Seng Index up moderately. ES futures are also in the green. Despite all the angst in the credit and FX markets, equity markets are betting that Beijing will blink yet one more time. When I was a young pup and learning technical analysis, I was told to think of the stock market as an army. To discern the direction of the market, you should watch the way the bulk of the army is moving. Maturing bull markets, it is said, typically have narrowing leadership of large cap stocks. When the major averages like the Dow may continue to advance and achieve new highs but the rest of the market fail to show similar levels of strength, it becomes a case of the generals leading but the troops refuse to follow - a warning sign for stock prices. Breadth indicators are the way technical analysts measure the direction of the "army". I have read a number of concerns expressed on blogs and message boards about the general breadth deterioration in US equities. I have voice similar concerns myself about the downtrend in the number of stocks trading above the 200 day moving average (see Is the correction over?) . Breadth can be measured in a number of ways. Instead of just expressing an opinion about what this indicator or that indicator is doing, I thought I would conduct a survey of different popular breadth measures, along with their behavior in the last major market decline in 2007-2008. One of the classic breadth measures is the cumulative advance-decline line. The chart below of the SP 1500 advance-decline line is showing a case of continue strength. The bull is still charging, according to this measure. This indicator is showing an unambiguous bullish signal. Another way of measuring the difference in behavior between the "generals" and the "troops" is to watch the performance of small caps compared to large caps. The chart below shows three lines. The black line in the top panel shows the relative ratio of the small cap Russell 2000 Index (IWM) against the large cap SP 500 (SPY). 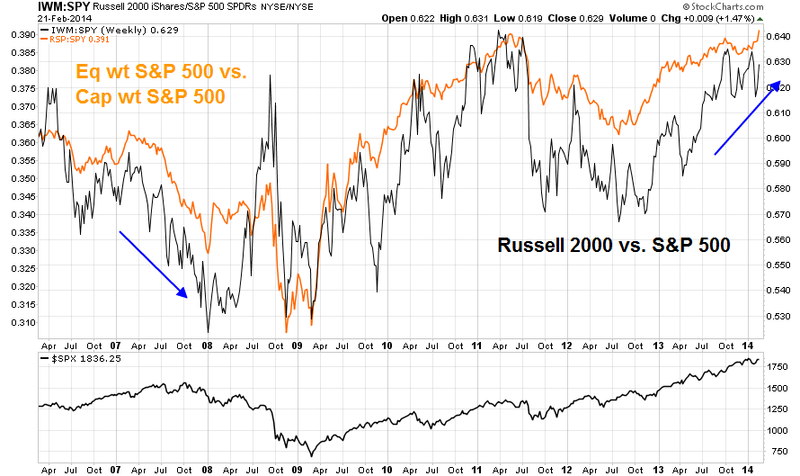 The orange line is the relative return of the equal weighted SP 500 (RSP) against the cap weighted SP 500 (SPY). This relative ratio measures the relative of small caps "troops" against the large cap "generals" in a slightly different way than a simple Russell 2000 to SP 500 ratio. The equal weight SP 500 gives an equal weight to the heavyweights in the index such as Apple, GE and ExxonMobil, shows the movements of the individual stocks in the index in a more "democratic" (1 stock, 1 vote) fashion. The the third line in the chart in bottom panel shows the SP 500. Here are a number of observations from this chart. First of all, the RSP/SPY ratio appears to be more stable and less volatile compared to the IWM/SPY ratio, though they are well correlated with each other. In 2007-2008 bear market episode, both of the RSP/SPY and IWM/SPY breadth indicators topped out a few months before the final top in 2007 and deteriorated significantly afterwards. During the budget impasse and eurozone crisis scare of 2011, breadth deterioration was roughly coincidental with the market. Today, these breadth indicators are either flat or trending upwards and show few indications of a major top developing. Call these indicator neutral to slightly bullish. 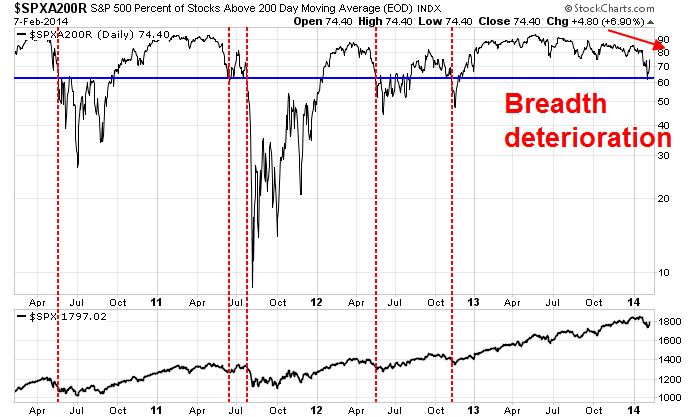 A more subtle way of measuring breadth is to watch how market internals are behaving. The chart below of SP 500 Highs - Lows show only minor weakness, compared to a pattern of major deterioration during the 2007-2008 episode. This indicator seems to be very noisy. I would hesitate about using this indicator to call a top without a prolonged pattern lower lows and lower highs. Score this indicator as neutral. Another aggregate way of analyzing market internals is to watch the percentage of stocks in the SP 500 that are showing point and figure buy signals. Here the signals are a bit more mixed. At one level, we are seeing some breadth deterioration as there is a pattern of lower lows and lower highs. However, this kind of downtrend has thrown off false warnings in the past. On the other hand, this index has not fallen to levels (shaded in yellow) where major declines have occurred in the past. The signal from this indicator is neutral to slightly bearish. My last breadth indicator, the percentage of stocks in the SP 500 trading their 200 day moving average, is telling a story of caution. As the chart below shows, this indicator has been deteriorating in a pattern of lower lows and lower highs for about a year. 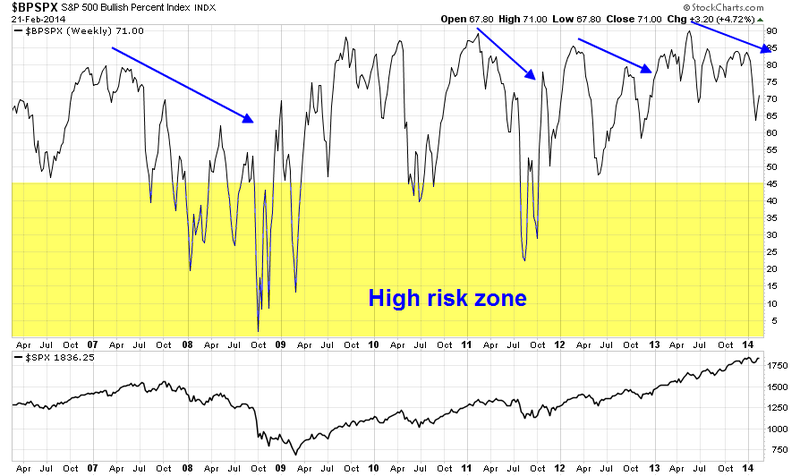 During the 2007-2008 episode, this indicator topped out several months ahead of the actual top. One logical way of using this indicator is use the deterioration as a warning sign, but don't sell until the actual trend break in the SP 500 itself, which is marked by the vertical red line. Today, we had a minor trend break in the SP 500 when the market dipped below its 50 day moving average in its most recent decline. However, it was only a brief and minor violation of the uptrend. While it does serve as a warning sign, I cannot call the event a definitive sell signal for the market in light of the strength of the other breadth indicators. The signal from this breadth indicator can be categorized as somewhat cautious, but not unambiguously bearish. In summary, the weight of the evidence my survey of breadth indicators and their behavior in the past eight years indicate that the market isn't showing a case of bad breadth yet. Breadth indicators, while mixed overall, are tilted slightly bullishly. While some stock market weakness may be around the corner, it is probably too early to call a top in the stock market. These reading suggest that further new highs in the major indices are possible and the next 5% move is more like to be up than down. Remember that market tops are processes that generally develop slowly and they are accompanied by warning signs of technical deterioration. Getting bearish today seems to be overly premature. The current technical picture is still consistent with my base case scenario of a stock market top later this year (see My plan for 2014). A biotech bubble? Maybe not! The biotechnology sector has been on a tear for the past few years. A glance at the biotech ETF (IBB) shows that this group (bottom panel) has been steadily advancing since the stock market bottomed in 2009. 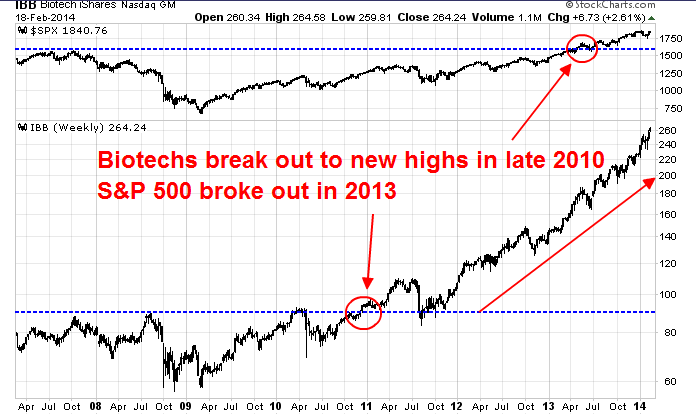 It decisively broke out to new all-time highs in late 2010. By contrast, the SPX (top panel) didn't exceed its old highs until three years later in 2013. The fastest start to a year for US biotech initial public offerings is stoking fears of a bubble amid concerns investors are taking risks on companies at the earliest stage of medical research. Another eight biotech companies raised a combined $502m in US listings last week, setting a weekly record for the sector and continuing a boom that has seen the Nasdaq biotech index rise more than two-thirds in the past year. However, fears of overheating are growing as companies come to market at an early stage of drug development when failures are high – and in one case without the usual restrictions that bar existing owners from making a quick profit on IPOs. There are several reasons to hope that even if the current share-price and IPO frenzy subsides, biotech firms will continue to prosper. First, many smaller firms have become the research engines for bigger ones, explains Kevin Starr of Third Rock, a venture-capital firm. For example Sanofi, a French pharmaceutical giant, now depends on Regeneron, an American biotech company, to help drive its growth. This year alone, Sanofi will pump about $1 billion into Regeneron’s research programme. The goal is not to "Sanofise" Regeneron or any other partner, says Christopher Viehbacher, Sanofi’s chief executive. Rather, it is to combine Regeneron’s capabilities in researching new treatments with Sanofi’s skill in bringing them to market. Celgene, one of America’s larger biotech firms, has a similar "distributed model" of research. It helps finance the scientific work at smaller companies, then usually takes over a drug’s development as it moves into clinical trials. Besides being costly, these require expertise that younger, smaller firms often lack. Second--and more important--firms are at last starting to reap the rewards of studying the human genome. As researchers illuminate the underlying genetic causes of a disease, they open up new routes to developing treatments. For example, Vertex has a drug to treat a subset of patients with cystic fibrosis, thanks to a better understanding of the faulty gene that causes it. Bluebird bio, one of Celgene’s small partner firms, which Third Rock also financed, is working on a treatment for sickle-cell disease that inserts into the patient’s blood cells a properly functioning version of the faulty gene that causes the inherited ailment. Advances in genomics are making clinical trials smaller and cheaper, since it is now easier to identify which patients have the specific genetic trait that a new drug is aimed at. This makes it more worthwhile to research diseases that are rare, and those that have so far proved intractable. The FDA gives special consideration to drugs that treat such ailments, so companies can expect a speedier path to approval. From a technician's viewpoint, the surge in this group may be just starting. A 15 year chart of the relative returns of IBB against SPY shows that the biotech group only recently staged a relative breakout out of a long multi-year base lasting over a decade. This technical pattern suggests that biotechnology stocks could be the next moonshot winner - the next darling group that the momentum crowd embraces and outperformance could go on for much longer than anyone imagines. We may need comments like "valuations don't matter" and the emergence some truly *ahem* creative valuation techniques, such as the price to eyeballs metric of the internet era, before the bubble pops. Obviously this call is highly speculative. If I am right, shorting biotechs now could be like shorting technology when Netscape did its IPO because the valuations were overly ambitious. He says "Robert Downey Jr.", I say "Paris Hilton". In 2012, the actor Robert Downey Jr., played the role of Tony Stark, a.k.a. Iron Man, in “The Avengers.” For his work in that single film, Mr. Downey was paid an astounding $50 million. Does that fact make you mad? Does his compensation strike you as a great injustice? Does it make you want to take to the streets in protest? These questions go to the heart of the debate over economic inequality, to which President Obama has recently been drawing attention. A reliable tax system is also important to ensure that the wealthy pay their fair share to support the public weal. That is generally the case. Our tax system is far from perfect and is arguably in dire need of reform, but examples of the tax-dodging wealthy are not at all the norm. The Tax Policy Center estimates that in 2013, the top one-tenth of 1 percent of the income distribution, those earning more than $2.7 million, paid 33.8 percent of their income in federal taxes. By contrast, the middle class, defined as the middle fifth of the income distribution, paid just 12.4 percent. I have two responses to Mankiw's points. In my previous post (Inequality, does it matter? ), I wrote that in order for the American Dream to flourish, it is the equality of opportunity that matters the most. Mankiw is partially right, most people would not begrudge an entertainer, sports figure, or company founder from his or her wealth. The flip side of that coin is that people must also be allowed to fail, otherwise the free market becomes impaired by policies that support a segment of the population that did not earn their rewards. Otherwise, the "destruction" part of "creative destruction" doesn't happen. I present, as Exhibit 1, Paris Hilton. How is someone like Paris Hilton, who is famous for being famous because of her surname, deserving of her wealth and career? Should a poor black girl in the slums who is similar self-absorbed be deserving of such fame and public notoriety? As supporting evidence, I present the Rich Kids of Instagram, a generation of ultra-rich young men and women who did nothing to earn their wealth. While we might be inclined to congratulate and celebrate the accomplishment of the parents who were able to generate such riches, we are far less inclined to celebrate the behavior of a generation of out of control rich kids. These kids haven’t learned the value of a dollar. They certainly know how to spend it, but it is less clear they know how to make it. Allowing downside of creative destruction to work is the same principle that I espoused when I advocated bringing back the partnership investment bank (see A proposal for reforming Wall Street). If you don't let the TBTF institutions to make mistakes, you end up with a case of mis-aligned incentives and, at best, a society dominated by crony capitalism. Tax policy an instance of where the rubber meets the road in the application of the principle of creative destruction. Mankiw contends that the rich pay their fair share of taxes, but does current tax policy encourage the entrenchment of an Upstairs/Downstairs class system, or does it allow free market forces to do their work so that destructive part of creative destruction to occur? Did it encourage more investment in the economy because it lowered the cost of equity? Or was the main effect a shift in preference between debt and equity financing? Did it shift taxable individual investor preferences towards equity and away from municipal bonds, which raised the cost of capital for state and local authorities? If so, was that an intended or unintended side effect? I would contend that current American tax policy, particularly under Bush II, has served to entrench established interests, encourage crony capitalism and ultimately impair market efficiency. An upstairs/downstairs society only impairs American competitiveness. Surely, Greg Mankiw is not against allowing free market forces to work, is he? This chart first appeared late last year when Tom McClellan posted it to his site. I post Tom’s material here at Pragcap on occasion and find it to be of consistently high quality. I didn’t post that original piece because I thought some people might misinterpret the 1929 chart and believe that it was fear mongering. That’s exactly what happened. And after a bit of controversy followed the original post Tom posted a follow-up which explained the chart in more detail. It was a very useful explanation that cleared up much of the confusion. But the confusion has continued today primarily because some other people have picked up on the chart and used it to imply that we could be on the verge of that 40%+ crash. The thing is, Tom never implied this. He was simply pointing out that the market pattern was similar. In other words, the chart below very clearly shows that the potential downside risk to the Dow is about the 14,000 level. Therefore, the downside risk according to Tom’s analysis is 12.5%. NOT 40%+. I attracted a lot of attention, and a lot of derision, when I wrote about the resemblance of the current market's price pattern to that which occurred back in 1929. This week's chart updates that relationship, and we can see that the relationship has not broken correlation yet. 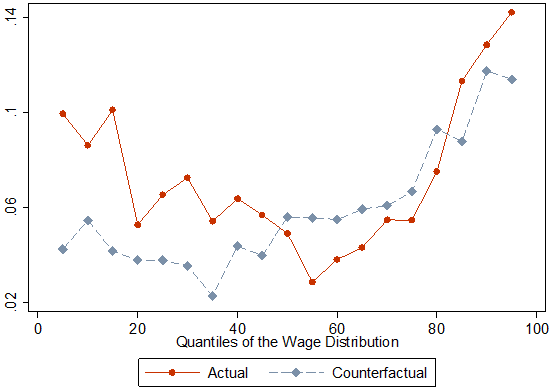 For as long as the correlation continues, it is interesting and potentially useful. But anyone who endeavors to employ such an analytical tool should understand that all such pattern analog relationships break correlation eventually, so they should always be viewed with skepticism alongside the fascination we have for the pattern correlation and its (potential) message about the future. He went on to justify his use of pattern recognition as part of the technical analyst's toolkit. Why do price pattern analogs ever work at all? My answer is that human populations tend to fall into similar and repeating patterns of human emotional response, and this gets reflected in repeating patterns of price action. This is the entire basis for classical bar chart pattern analysis. Even though 2 different triangles might look different in some ways, or 2 different head and shoulders structures, the driving psychology behind the formation of such structures is largely the same, and tends to result in similar outcomes. I would tend to agree with these comments. Technical analysis is a form of behavioral finance and that's why patterns can repeat themselves (see my previous post Technical analysis as behavioral finance). [L]et me offer a case history to illustrate how price magnitude is not really the important factor in governing the way that prices behave, and whether or not an analog is valid. Most modern traders have at least heard of the big crash of 1987, but few remember the little micro-crash of 1994. The total price damage in 1994, top to bottom, was just 9.9%, and yet the pattern itself strongly resembles what happened in 1987. The magnitude of the 1987 event was much greater, both in terms of the volatility before the top and the severity of the actual crash. And yet the "dance steps" look an awful lot like what happened in 1994. By monitoring these fundamental triggers, we can determine whether the pattern is continuing or breaking down. Guidance has overwhelmingly been negative in recent quarters and the trend has largely remained in place in the Q4 reporting season as well. 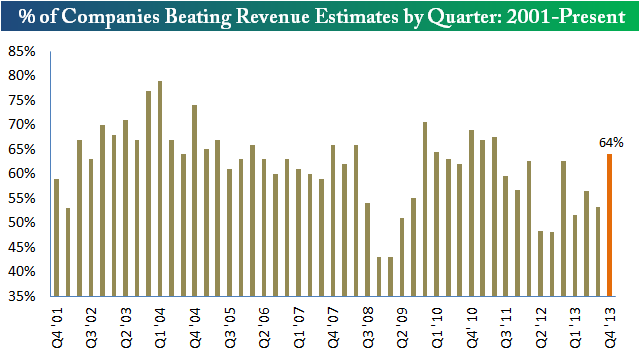 As a result, estimates for 2014 Q1 and beyond have been coming down as the earnings season has unfolded. Per Thomson Reuters, the “forward 4-quarter” EPS estimate for the SP 500 slipped $0.25 this past week to $119.33 versus last week’s $119.58. The p.e ratio on the forward estimate rose to 15.4(x) and the PEG ratio rose a smidge last week to 2.49(x). The earnings yield on the SP 500 is 6.49% as of Friday, 2/14/14. The growth rate of the forward 4-quarter estimate fell last week to 6.19% from the prior week’s 6.38%. With about 400 of the SP 500 having reported q4 ’13 financial results, the +9.5% year-over-year growth rate for the index is the best growth rate since late 2011. We are keeping an eye on 2014′s full-year SP earnings growth rate, which currently stands at +9.2%, vs. the +10.8% on Jan 1, ’14. The only sector to see higher expected earnings growth for full-year 2014, this week vs. Jan 1 ’14 is Telecom, which has seen expected full-year growth expand from +13.5% to +15.9%. If you want one quick-and-dirty key indicator to watch, I would focus on how cyclical stocks are performing relative to the market. For now, the Morgan Stanley Cyclical Index remains in a relative uptrend against the market - but just barely. You can get a live update of this chart here. If the relative uptrend breaks down, then the risk of a market downturn rises. Two investment products worth nearly 1.3 billion yuan (HK$1.66 billion) that were distributed by China Construction Bank (0939) and Ping An Insurance (2318) are on the verge of default. The second saw three funds backed by Beijing Roll- in Investment Management fail to repay investors after maturity. Capital plus interest on the product has reached one billion yuan, 21cbh.com reported. [E]pisodes like Credit Equals Gold and Opulent Blessing Project are just the beginning, says Mike Werner, senior analyst at Bernstein Research, in a note today. Werner argues that rising interest rates on the interbank market reflect the Chinese government’s crackdown on shadow (a.k.a. off-balance-sheet) credit and have already taken their toll on the trust industry. While assets managed by China’s trust firms are up 46% from the end of 2012, that growth is less than the 73% year-on-year growth in Q2 2013. Rising rates will make it hard for bankrupt companies to find the cash to pay back investors, he says. 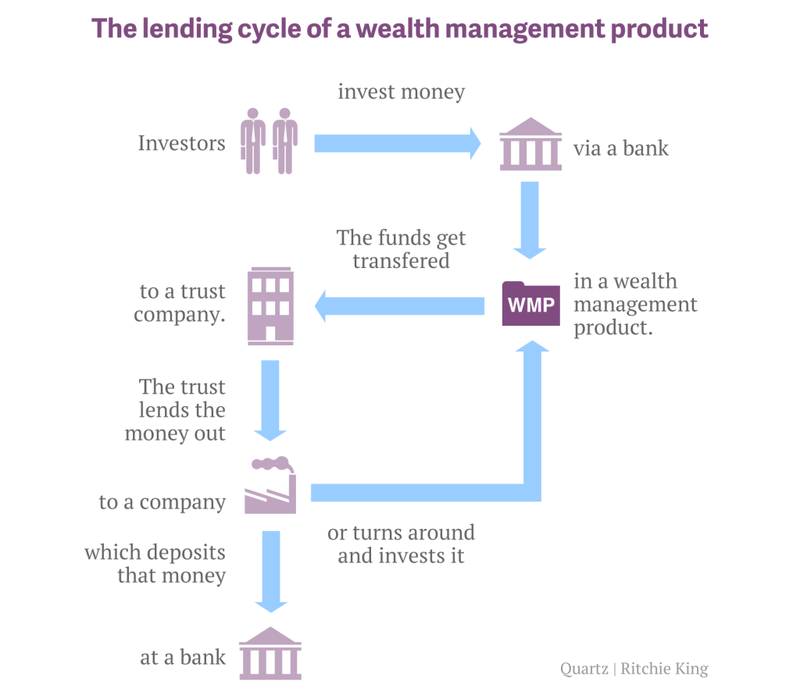 Many of these trust and wealth management products were issued or marketed by state-owned banks and carried implicit guarantees by these same state-owned banks. The key issues are whether the government will allow defaults to occur and, if so, whether to rescue them through the backdoor (see my previous posts How resilient is China? and Chinese inequality and the growth imperative). Stresses are starting to show up in my so-called "Chinese canaries", which are mainland banks listed in HK. While readings are not at the panic levels seen during the heights of the 2011 eurozone crisis, risk levels do appear to be elevated. You can get a live update of this chart here to monitor the risk of rising Chinese financial turmoil, which could cause trouble for global financial markets. In conclusion, I do not believe that we are on the verge of a 1929 style market meltdown. However, market patterns can repeat themselves and we could see a 10-15% hiccup in stock prices in the near term. I have outlined two likely causes of such a downdraft, namely a US growth scare and rising Chinese tail-risk. For now, the charts show that the markets remain on the precipice on these two key triggers. For readers who want to play along at home, just watch these two charts (CYC vs SPX and DSUM vs IEF) to see if the pattern could repeat itself. As things stand now, the bears shouldn't get overly excited about the prospect of a steep drop-off in stock prices. Unless the two key indicators decisively break their relative uptrends in an unambiguous fashion, I am inclined to give the bull case the benefit of the doubt. I’ve been getting some emails and read a few articles recently about the strength in Europe. And sure, since the summer of 2012 (when the Eurozone was actually being called an “experiment”) European stocks have rallied very nicely. But when looking at a longer-term chart, it appears like just a counter-trend bounce. He went on to zoom into a closer look and indicated that the FEZ/SPY pair was still in a wedge. In other words, the jury is still out. FEZ consists of large cap eurozone stocks with global companies such as Total, Siemens and Daimler, which is more of a play on global growth and the competitiveness of European exporters. A better way to be exposed to European growth is DFE, which is the European small cap ETF, as small caps do more business in Europe and they are sensitive to the growth outlook in that region. A look at the relative returns of DFE to IWM (European small caps to American small caps) clearly shows which region has the upper hand in relative strength, though DFE appears a bit extended against IWM. In addition to DFE representing European small caps, it has one other key difference relative to FEZ. While FEZ represents just eurozone equities, a detailed examination of the structure of DFE has a significant weight in non-eurozone countries, such as the UK (25%) and Switzerland (9%). 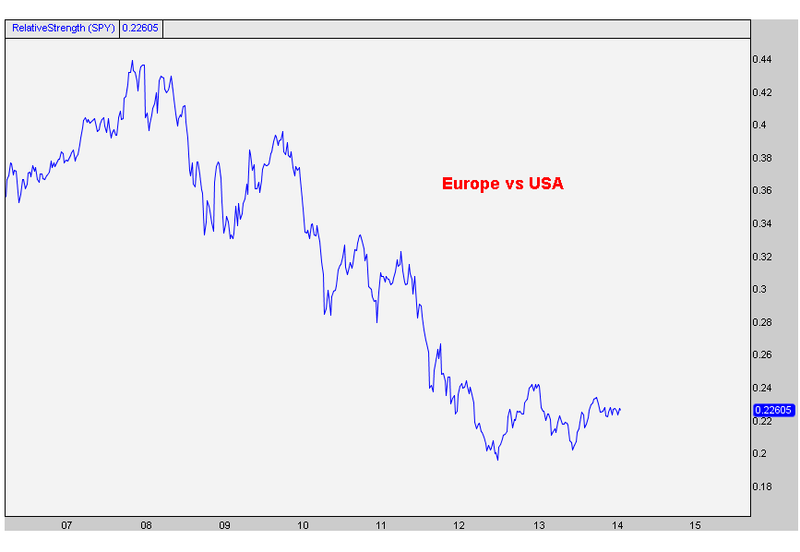 On a relative strength basis, however, the momentum continues to favor European small caps and, by extension, the prospect for Europe's economic recovery. My inner trader understands the risks raised by Yardeni, but also knows that these things sometimes don't matter to the market until they matter. So he is inclined to stay with the momentum trade, but maintain a tight risk control discipline to limit losses. If you share your home with a spouse, you don't have as much space for yourself as a solitary occupant of the same property. But both of you probably enjoy the benefits of more than half a house. If a couple owns one car, similarly, both have more than half a car. Even food is semi-rival, as the classic "You gonna eat that?" question proves. a=1 corresponds to pure rivalry: Partners pool their income, buy stuff, then separately consume their half. a=0 corresponds to pure non-rivalry: Partners pool their income, buy stuff, then jointly consume the whole. As you'd expect, the low-earning spouse makes out like a bandit. The surprise: The high-earning spouse gains as well - for all four ways to estimate real-world rivalry. If consumption were 100% rival, in contrast, the high-earner would lose $10,000 - precisely the amount the low earner gains. New research shows that a couple can pocket thousands of dollars by trading in separate one-bedroom apartments for a two- or even three-bedroom pad. I think what is lacking in this model is the dimension of time. This coldly analytical approach could be used to model the behavior of roommates. What is different is that roommates are generally not committed to staying together for an indefinite period of time. The benefits of sharing rise as time horizon rises. Roommates may agree to undertake capital expenditures, such as a washing machine, under some sort of formal financial arrangement (I buy it, you pay me your half when you leave), but what roommates would agree to buy a long-lived asset like a house and correspondingly assume a long-lived liability like a mortgage together (not to mention other commitments with long time horizons like bringing up children)? It is those kinds of benefits that makes the institution of marriage stand out. I have been married to Mrs. Humble Student of the Markets for nearly two decades and we have known each other for about three decades. I can attest to that I consider myself fortunate to have been with her for all this time and derived a great deal of benefit during this period. To my wife - thank you for putting up with me for all those years. The price of gold and gold stocks have been behaving a lot better in the past few weeks and it has prompted a number of technicians to proclaim a bottom in gold. I have found that inter-market analysis can tell us a lot more about the underlying technical picture of an asset than a pure technical focus on the asset itself. My own take is that we are seeing a tradable tactical bottom, but don't count on an intermediate or long term bottom in gold. The main basis for my conclusion is the behavior of the silver/gold ratio. Silver is said to be the poor man's gold and tends to have a higher precious metal beta. The chart below shows the gold price in the top panel and the silver/gold ratio in the bottom panel. Note how gold has rallied out of a downtrend in the top chart, which is what got a lot of technicians and goldbugs excited. 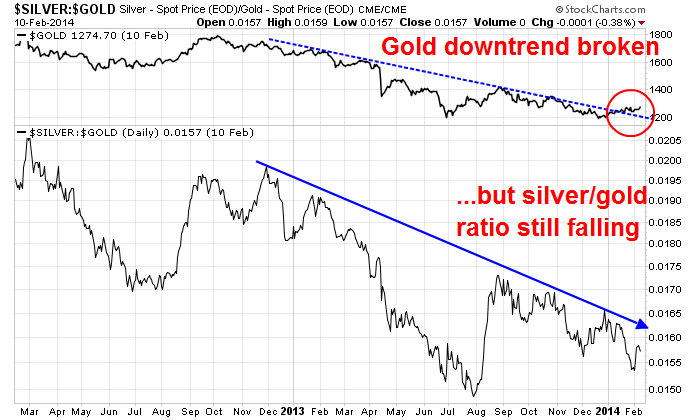 By contrast, the silver/gold ratio remains in a downtrend. If gold has staged a convincing bottom, why isn't silver participating? Now look at this same chart back at the last gold bottom at about the $250 level in 1999 and 2001. 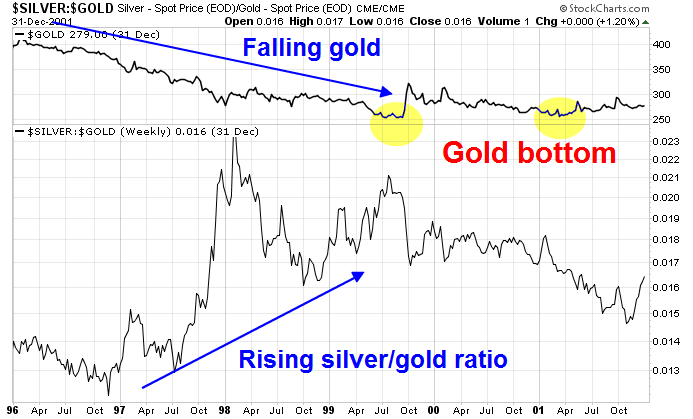 Note how the silver/gold ratio turned up well before the first gold bottom. Now look at the first chart of the current silver/gold ratio and tell me that we are seeing a durable bottom in the gold price. 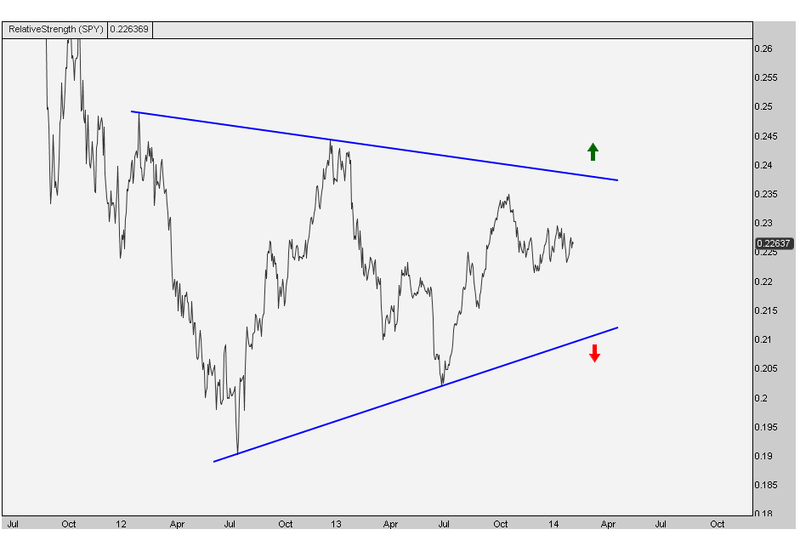 The combination of a gold rally out of a downtrend and a falling silver/gold ratio suggests that we are more likely to see a period of consolidation or tactical rally in the gold price. A realistic upside rally target might be the 1400-1460 resistance zone, which is roughly where the 38.2% Fibonacci retracement level is. If you are a goldbug and want to write me about how the Yellen Fed is overly dovish and stands ready to print and debase the currency, etc., I refer you to my favorite analysis from Otto Rock. While it is somewhat dated, the truths about goldbugs remains eternal. As the equity markets rallied on Thursday and Friday, I saw a number of analysts and commentators starting to jump on the bulls' bandwagon as they asked the question, "Is the correction over?" Neither of those reasons make a lot of fundamental sense. I will write about what I believe to be the real reason for the decline and their implications later on in this post. 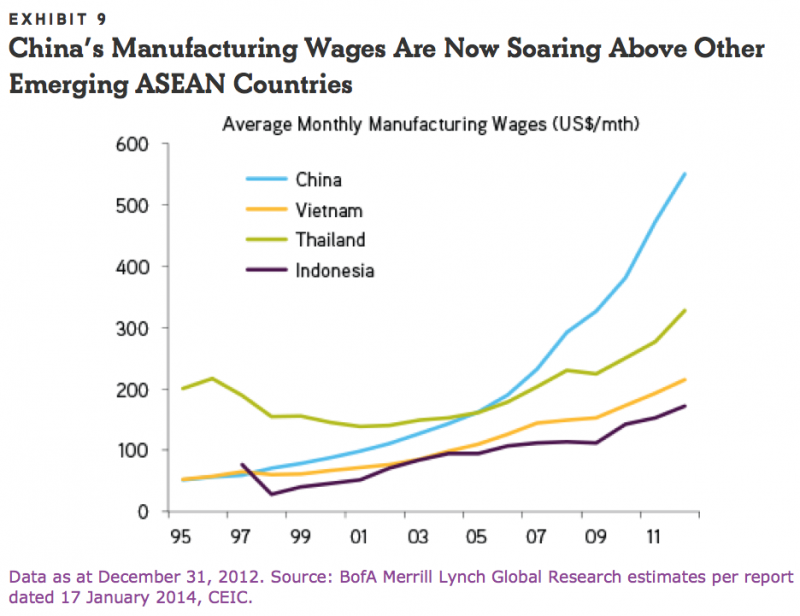 A repeat of the Asian Crisis? Helping some of the emerging markets weather their storms should be the record amount of non-gold international reserves that they hold. IMF data show that collectively they held a record $7.8 trillion during November. China’s reserves account for about half of that sum. However, some of the more troubled emerging economies also held sizeable record or near-record reserves at the end of last year: Russia ($470bn), Brazil ($356bn), India ($275bn), Turkey ($129bn), South Africa ($45bn), and Argentina ($28bn). In an amusing and more pointed commentary, Macro Man asked, "If there is a crisis, where's the so-called 'body'?" OUTSIDE SCREAMING "Murder! There's been a murder! Mr Holmes! Come quick!" HOLMES "Watson, bring me my coat, it appears that there is a disturbance". HOLMES "Please, can you all calm down. what is the trouble?" CROWD "There s been a MURDER well more than one murder, its terrible! It's down the Eeyems. Mrs Turkey. She's DEAD! And Mr Rand, And the Hungarian lass and the Russki kid. HOLMES "Come Watson, best we pay a visit, if for no reason other than to calm this over-excitable lot." HOLMES "Ah Mrs Turkey, I see that you are breathing. A good sign of a lack of death. Watson, would you be so kind? Dr WATSON "Her PMI is slightly weaker than the last reading but apart from a bit of bruising to the FX causing some rate shock she's not in too bad a way". HOLMES "Hmm .. so not DEAD then Watson". Dr WATSON "No sir. Not Dead." HOLMES "Not a murder then. No." BYSTANDER "But, but she WILL die though and THEN it will be a murder"
HOLMES "It will only be murder when I say it is a murder. What makes you so sure that she will be murdered"
BYSTANDER "Well look at her, she's weak and feeble, hasn't been able to defend herself against the last attackers so she's just bound to be murdered"
...and so on. Was Mr. Market so excitable to freak out on the mere possibility of an EM currency crisis? These conditions were present during the equity market run-up and bulls have shrugged off these kinds of concerns before. 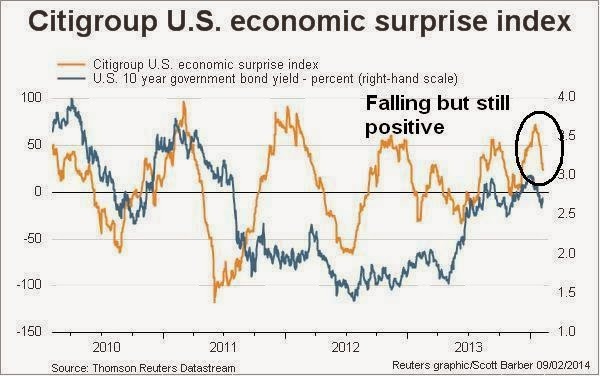 What about fears of a US growth slowdown? 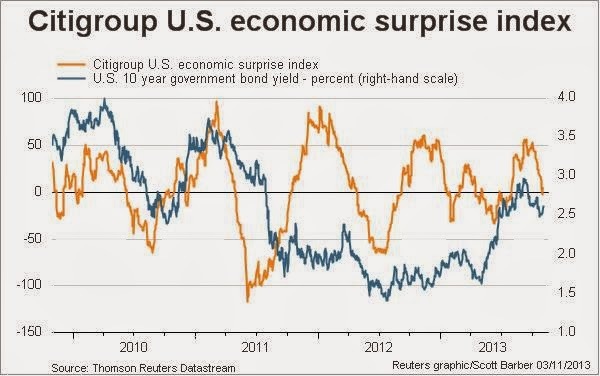 The chart below of the Citigroup US Surprise Index (in orange) measures whether the latest macro-economic releases have beaten or missed Street expectations. A positive reading indicates that there were more beats than misses and a negative reading the opposite. While the pace of "beats" have been coming down, they remain positive. So relax. If the economy is slowing down, what about corporate earnings? 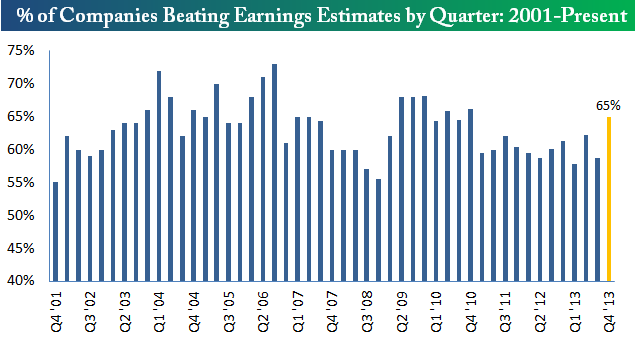 As Bespoke pointed out, with about 2/3 of companies having reported Q4 earnings, the earnings beat rates are above the historical average. Stock prices are mainly driven by earnings, interest rates and the growth outlook. With the latest Earning Season's reports coming in at above average clip and 10-year interest rates falling, what could investors be so worried about? The simplest explanation of the recent pullback is because of excessively bullish sentiment and an overbought condition in the market. The fast money got into a crowded long position and, when there were no buyers left and the momentum started to roll over, the crowd seized on the excuse of the day (EM crisis, Fed taper, US economic weakness, etc.) to sell. 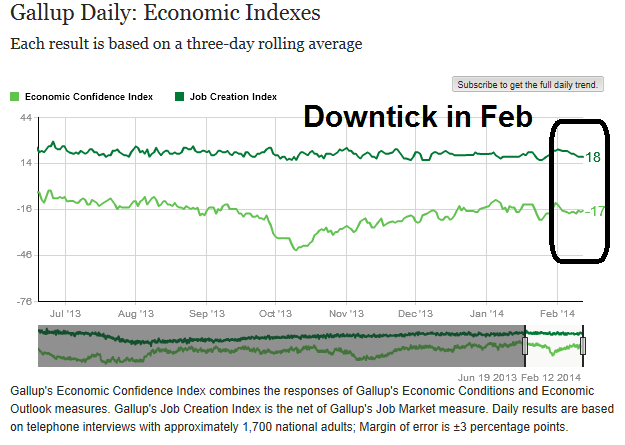 Has the stock market bottomed? With bullish sentiment in full retreat, is this a time for traders to plunge back into the long side of the stock market? Not so fast. An examination of longer term indicators suggest that a durable bottom may not be at hand yet. 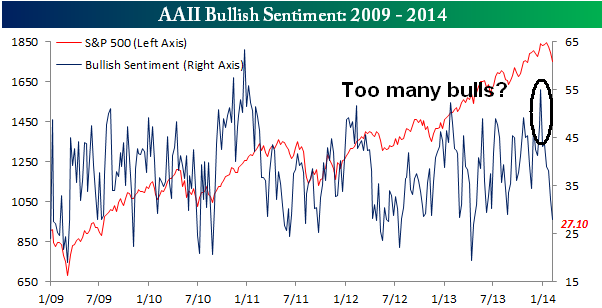 While the AAII sentiment surveys are measures of opinion and intention, the AAII Allocation Survey is a measure of investors actually did - this is a case of watching what they do, not just what they say. 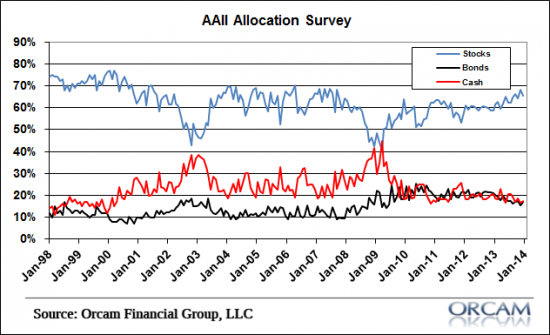 The latest AAII Allocation Survey (via Pragmatic Capitalism) shows that while equity allocations have ticked down, they are nowhere near panic levels. An analysis of short and longer term market breadth indicators tell a more nuanced story than the more simple oversold bounce narrative. While short-term indicators suggest that a bounce is at hand, longer term indicators are not necessarily showing the signs of full capitulation and more volatility is ahead. Consider, for example, this chart of the percentage of stocks below their 50 day moving average (shown in the top panel) as an example of a short-term breadth indicator (SP 500 shown in the bottom panel). I drew a blue horizontal line to indicate the level this indicator reached last week and dotted red vertical lines to show past instances when a similar level was breached in the last four years. 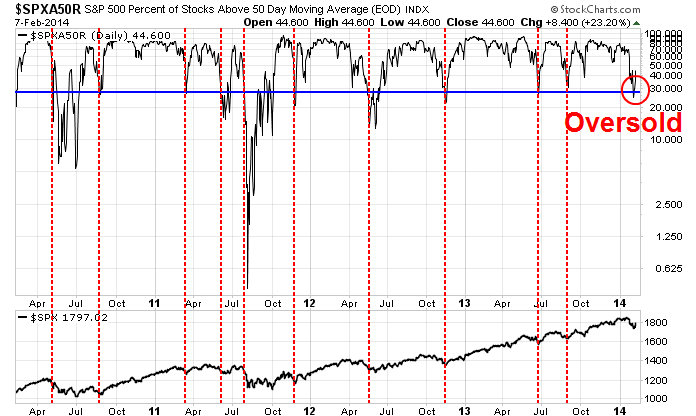 More often than not, the levels reached last week are consistent with short-term bottoms and bounces in stock prices. By contrast, the longer term measure of the percentage of stocks below their 200 day moving average does not show a similar picture of wildly oversold conditions as the 50 dma measure. There are several notable features of this chart compared to the one above. First of all, there are fewer signals. As well, note the negative divergence where the percentage of stocks below the 200 dma have been trending down in the past few weeks while the SPX has been rising during the same period. More importantly, when this indicator has reached similar readings in the past, it has tended to continue to deteriorate - indicating that further declines in breadth, which were accompanied by market volatility, were at hand. 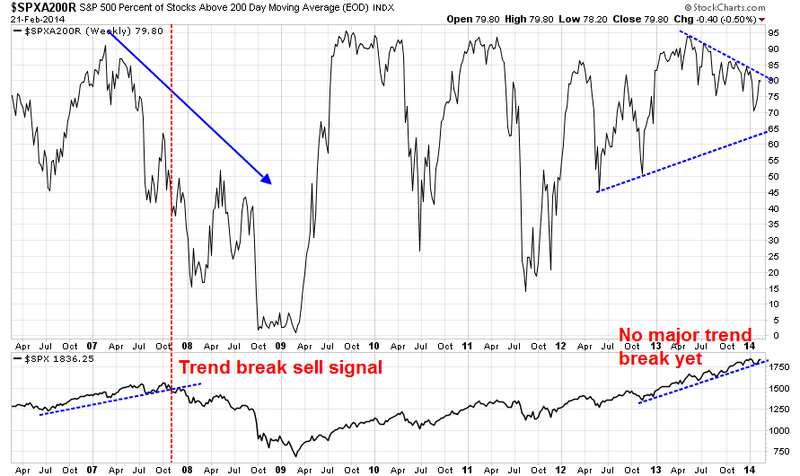 The more important test for the bulls is how this breadth indicator when the market rallies. 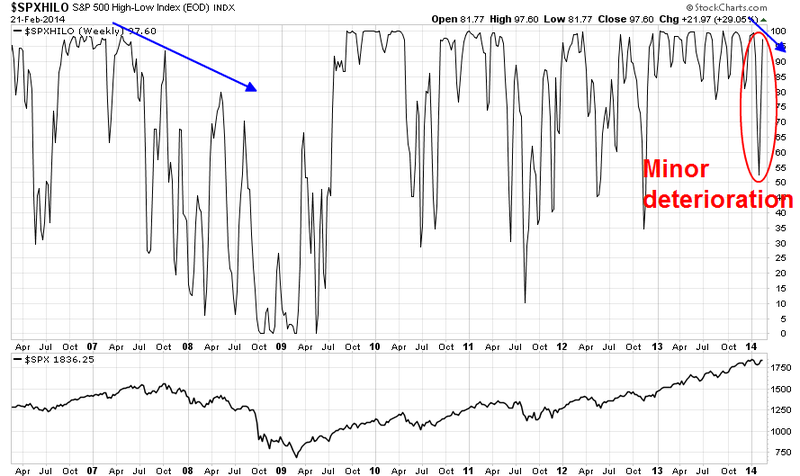 If breadth continues to deteriorate, then it may be a mark of an intermediate term top. My conclusion is that too much technical damage has been sustained by the market for equities to simply rebound and rally to new highs immediately. The chart of the SP 1500 advance-decline line below has breached an uptrend line that stretched all the way back to late 2012. Such violations tend not to be resolved by a bounce back from an oversold condition and, at a minimum, a period of sideways consolidation is needed before stock prices can go higher. 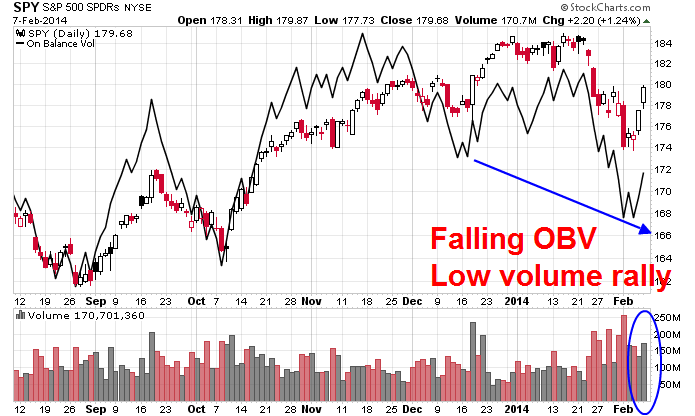 What's more, the rally last week was achieved on relatively low volume and a pattern of falling on-balance-volume. These are signs of distribution - and not the typical technical signature of a sustainable rally. However, I remain constructive on the intermediate term trend for stock prices. The chart below of the relative performance of cyclical stocks to the market shows the relative uptrend of cyclicals to be (barely) intact. The combination of upbeat earnings and revenue reports this Earnings Season and cyclical leadership leads me to tilt towards a bullish intermediate term equity market outlook. Putting it all together, my best guess of market direction is a short-term rally followed by several weeks of volatility, with the SPX bounded by the 200 dma below and the 50 dma above. The chart below of another longer term breadth indicator, percentage of stocks with bullish point and figure readings, tell the story. 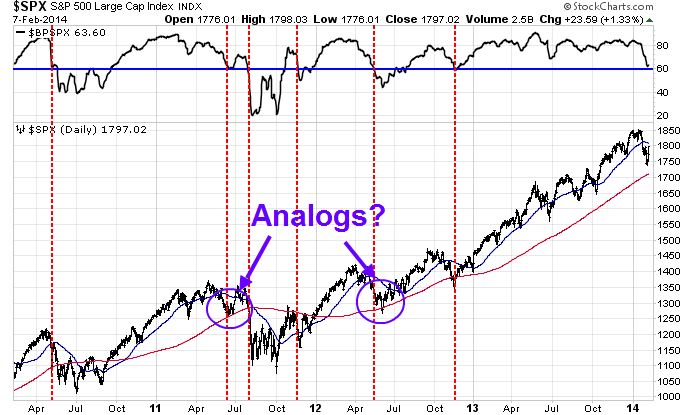 Given the recency of the breach of the 50 dma, the most likely analogs of current market conditions occurred in the summers of 2011 and 2012 (circled), where stock prices bounced around in a volatile fashion until breadth measures began to improve again and stock prices began to rally again. For now, my inner trader is getting ready for volatility and highly tempted to go short this market as the SPX approaches the 50 dma at about the 1810 level. My inner investor is yawning and ignoring all of the short-term fluctuations. If he had some new cash, he would regard the current weakness as a buying opportunity. Did Zero Hedge just turn bullish?